In June, 2014, I earned the Congressional Award at a ceremony in Washington, D.C. During the ceremony, I met Senator Cory Booker and Congressman Bill Pascrell. In this article, I would like to share how I earned the award, what I have learned from doing all of these activities, and give some advice to my fellow Honors students. The Congressional Award is given by the United States Congress to young people who set goals for themselves in the areas of Voluntary Public Service, Physical Fitness, Personal Development, and Expedition/Exploration, and achieve these goals. There are several levels of the award, the highest being the gold medal, which I earned and was awarded in June, 2014. The requirements for the Gold Medal are 400 hours of Voluntary Public Service, 200 hours of Physical Fitness, 200 hours of Personal Development, and a 4-day expedition/exploration. The Public Service, Fitness, and Personal Development areas also require you to spread out the hours earned over at least two years. You can learn more about the program here: http://congressionalaward.org/. For my community service, I volunteered at the Arc of Monmouth, the Monmouth County Park System, Colts Neck Fair, and at The Vector, my college newspaper. I helped at the Arc of Monmouth Thrift Shop that raises money for people with intellectual disabilities. I also led a group of volunteers to help the Monmouth County Park System to maintain and improve the quality of its gardens. At the Colts Neck Fair, I also organized a group of volunteers to raise money for my high school. For The Vector, our student newspaper, I wrote a world news column and set up an online news platform to help keep our student body informed about campus, national, and international events. I carried out renewable energy research on water electrolysis, a clean and sustainable method to produce hydrogen and oxygen. The hydrogen and oxygen produced from water electrolysis have many applications such as renewable energy storage, semiconductor manufacturing, petroleum refining, fuel cell cars, fertilizer production, and patient care in hospitals. For Physical Fitness, I practiced tennis for two years, mastering the fundamental skills of tennis and improving my stamina. During my Expedition, I immersed myself in Indian Culture by visiting North India. I experienced the rich cultural heritage of India through my expedition in North India and the Himalayas. By challenging myself with the Congressional Award, I have realized the importance of giving back to the community and enjoyed the wonderful experience of setting up and achieving personal goals. I started pursuing the Congressional Award during my sophomore year of high school and continued until the end of my sophomore year of college. During this time, I learned how to balance my obligations by finding ways to increase my productivity and prioritizing important work. I selected a few activities that I was passionate about and rigorously pursued them. Furthermore, pursuing the award has improved my leadership skills, bolstered my writing skills, refined my research skills, and increased my physical fitness. While doing all of this, I have matured and developed lasting skills that I can gainfully employ for the rest of my life. I encourage my fellow students to pursue the program, as it will be a learning experience for them and allow them to mature as individuals who can both succeed and give back to their communities. I would like to conclude this article by offering some advice to my fellow students. Depending on the program that you select, you will be at college for three to five years. This time will pass by before you know it. Therefore, make sure that you constantly seek out and seize opportunities to accomplish something positive for both yourself and for the greater good. Do not simply wait for opportunities to find you – you must be proactive. For instance, join a club, start volunteering, and seek out internships. Begin doing this as soon as you start college – do not wait, as time will pass quickly. Furthermore, find out where your talents lie and focus your time on developing them during college. You might enjoy mathematics, have a natural affinity for writing, and/or be intrigued by science. This is what I did through pursuing the Congressional Award, and I strongly recommend that you do the same. The Albert Dorman Honors College was the biggest attraction I had to NJIT when I was choosing my future after high school. After being here for three years, I can say that it was a decision that changed my life. I received many merit scholarships, all due to the gracious endowments given by the members of the Board of Visitors and other contributors; the Board of Visitors day on Friday, November 13th gave me the opportunity to thank them for their support, and that meant a great deal to me. The day started of with the Board of Visitors Roundtable where I was able to go from member to member and thank them for their contributions as well as tell them how their investment in our future has been paying off. At the roundtable, I was able to sit down and talk to the board members about their successes and learn from them key skills that led them to accomplish their goals. Through different conversations, I was able to understand the importance of perseverance, the necessity to fail, and of course always being philanthropic. After the roundtable, I was able to attend part of the annual Board of Visitors meeting where some of my colleagues presented to the members some of the service programs that have been planned and incorporated this semester. Before the presentation, however, the board members took the time to present different things they learned from the round table and all the complaints as well as compliments they had received about the Honors College. It was really nice to see that all the feedback that we told the board members was being heard at such a high level and that the members of the board actually took the time to listen to our thoughts and then spent more time to create resolutions. After the meeting, we escorted the board members along with the Dorman Family to the Campus Center Atrium where the Moonlight Duo celebrated the works of women composers and demonstrated how marvelous these composers were and how beautiful their music was. Seeing the concert with the board members was another intriguing experience, especially being able to tell them about our opinions and hear their perspectives. From the concert, the next stop was to have lunch with Albert Dorman, his family, and the other board members and talk to them about the initiatives we had presented in the morning. We were able to discuss with different board members our ideas and how they are increasing the already broad spectrum of the Honors College outreaches, and specifically how our outreaches aligned with the mission statement of the Honors College and NJIT in general. At the lunch, we were able to meet Dr. Bloom and I was able to take a picture with Dr. Bloom, Dr. Dorman, and Dr. Passerini which was something I could have never imagined happening when I came here as a freshman. Finally, after all this, I had the distinct pleasure of giving Dr. Dorman and his family a tour of the university as well as the Honors College and even my residence hall room! It was a really nice experience, talking to Dr. Dorman’s children and seeing a different side of the Dorman family. It was very enjoyable to see the family interact with each other and look at their name all over the college. Talking to them about their experiences and their successes and failures was truly unforgettable. Overall, it was a great day and I felt very lucky to be a part of it. “I’m an athlete” can be listed under the Top 3 Most Used sentences in my almost 3 semesters of college when introducing myself to new people, right behind, “I’m an international student,” and “I’m in the Honors College.” All three of these things define me and my college career in different ways, but today I just want to talk a little about my experience of being a student-athlete. Hopefully, this might crush some of the stereotypes about athletes in general because, no, we don’t run around in team apparel and sweatpants to show off. You can almost always assume that we had or will have practice later in the day. Being a student-athlete is more than what might first meet the eye. It’s not just travelling to “fun” places all over the country, getting free gear and talking about practice and competitions all the time. It’s waking up to your alarm that is ringing at 6:30 a.m. and quickly trying to turn it off to not wake your roommate. It’s getting up to get ready, putting on the clothes that are folded next to the bed and picking up the bag that is already packed from the night before. It’s sleepily grabbing your student ID and phone and running downstairs – the biting cold welcoming you to another day – and waking you up for the morning practice for which you’re now almost late. It’s running to GDS to get a small snack and then going to class after your 3-hour practice, still sweaty and exhausted, and seeing students stroll in who probably woke up five minutes ago. On some days, you get the chance to grab lunch in between classes, on some days you don’t; regardless, later you jog to the athletic center with a piece of fruit or a granola bar in your hand for afternoon practice, and that will need to suffice. Either two to three hours of fencing practice or an hour of strength and conditioning awaits, and it will leave you tired and hungry again. Being a student- athlete is getting dinner with the team and then heading back to your room to shower and finally starting your school work at 8 or 9. Some of your friends might be almost doneby that time, asking you to hang out. Mostly, you won’t have the time, and they will understand – you’re an athlete. It’s missing numerous lectures and labs for the sake of travelling to competitions, several times a semester, sometimes on consecutive weekends. I believe every single student at NJIT has taken a challenging class. Now imagine missing up to five or more lectures of that class during your season. But not only are you missing the class, you’re on the road, in a venue or in a hotel. There’s no easy way to quickly ask your TA or professor a question; you’re forced to study and understand the missed topics by yourself. It’s almost always challenging to balance getting enough sleep to not be exhausted at practice and having enough time to finish your work. It requires on-point time management – not that all athletes have it figured out perfectly (yes, sometimes I feel sleep deprived, but at least I finished that paper! ), but I am still proud to know that my teammates and I are doing great in school and still managing to perform well in our practices and competitions. Being a student-athlete is hard work and sometimes very exhausting, but I wouldn’t want to trade it for anything – in the end, the effort is worth it. How is my first semester at NJIT going? My personality and values have been shaped to a great degree by my family background and the places where I have lived. I was born to strict Indian parents and grew up as an American, but in places whose cultures were very different from US culture. This is what has made me what I am today. NJIT is just another aspect of life that will keep defining who I am. As a college, it has made many great impressions on me, and my first week of school was nothing but the best. I’m ecstatic that I chose the field of Computer Science and am enthusiastically looking forward to becoming a Dorman Honors college scholar. As I entered my first day at NJIT, I can confidently say I was overwhelmed, in a good way. There was just so much going on around campus and not enough time. There was a barbeque going on in the Honors Residence, at the same time there was Candy Bingo going on in Cypress and movie night in Redwood. While still trying to make new friends, I wanted to attend all these events. I was very surprised that they managed to keep us busy and never made us feel like there was nothing to do. One of my best impressions of NJIT was the Honors dorm. It made me feel like I’m living at the Hilton Hotel. The floors are always clean and the rooms are very spacious. The greatest part was that everyone on the floors got along and helped each other out with their homework. Besides the activities and the dorms, the first month of classes were spectacular. All my teachers are very understand and great at explaining the materials. They are very explicit on when homework is due and are ready to help during office hours if any concerns or questions come up. During my senior year of high school, I tried to explore a new field of learning besides business. That is when I fell in love with Computer Science. I tried out C++ and Intro to Java, and was amazed by the languages and the outputs they can produce. NJIT then seemed to be the perfect school to attend to continue to learn more in-depth about Computer Science and many other programming languages. My goal by the end of the semester is to be able to fluently learn Python and maintain a 4.0 GPA. One of the most important things I have learned is to help others, let it be homework, studying for tests, or carrying stuff up to their room. How is it possible to balance college, friends, and sleep? Past graduates have told me that you can only manage three of the two; good grades and a social life, good grades and sleep, or social life and sleep. They seem to be right! As of now I have been keeping up with my homework while still trying out hang out with my friends and attend dance practice and barely getting 5 hours of sleep a day. I’m trying to manage my life more efficiently but it just seems to never work out in my favor. I need to learn the habits of my sister who made time for her friends, kept her grades extremely high by getting a 4.0 GPA, and still got a good night sleep. I have envied her ability to take head first whatever comes soaring at her and still have time to have deep night conversations with me. Hopefully while being a Dorman Honors college scholar, I will learn to resolve my concerns. However, as a scholar I look forward to using the resources only Dorman Honors students have access to. I can’t wait to see what else NJIT has in store for the upcoming semesters. The last two months have been tremendous and my impressions of NJIT have only been getting better. I’m so thankful for the risk I took to pick up computing classes my senior year; that has made me into the person I am today and I don’t regret any of it. As any college student would say, there are always some concerns starting out as a freshman but I believe time will help me alleviate them. I have to learn how to manage my grades, friends, and sleep. All in all, NJIT will only help to individualize me as a person and help strengthen my identity. My personality and values will not only be shaped by my family background and places I’ve lived but also by NJIT and the Dorman Honors College. ve upon finishing, and where the after-party would be [held] later that evening. The elevator zoomed up to the scene, where all the volunteers and others were setting up with the music and tables and food. Glass panes stretched around the circumference of the room, allowing sunlight to inundate the setting, and I could see the Statue of Liberty, the Empire State Building, and hundreds of yellow taxis the size of ants from where I was standing. Being so high up to witness the incredible view was humbling, for it served as a reminder that our problems are minuscule when compared to the bigger picture – which, in this case, was analogous to the expanse of New York laid out before us. builders, and employees of major companies were just a few of the types of participants. When registration, held at the base of the building, was over, and I could return back to the 68th floor, I observed a sunset that bathed joyful – and sweaty – climbers in a fiery glow. The happiness from their accomplished feat was evident, and photos were taken left and right. As night fell, and the lights of the city twinkled back at the onlookers, the after-party began. Companies offered many treats, including fresh-pressed juices and ice cream sandwiches, and dinner was served to the deserving climbers and everyone else. With music blaring from the speakers and smiles as brilliant and ubiquitous as the city lights, the participants, volunteers, and coordinators reveled together in a job well-done and a day well-spent. 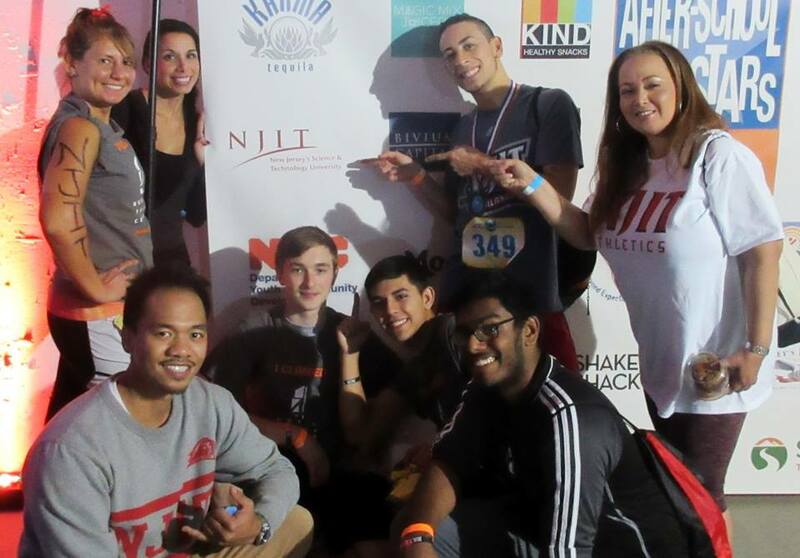 The NJIT Stairmasters climbed all 1,632 steps of 4 World Trade Center to support After-School All-Stars. 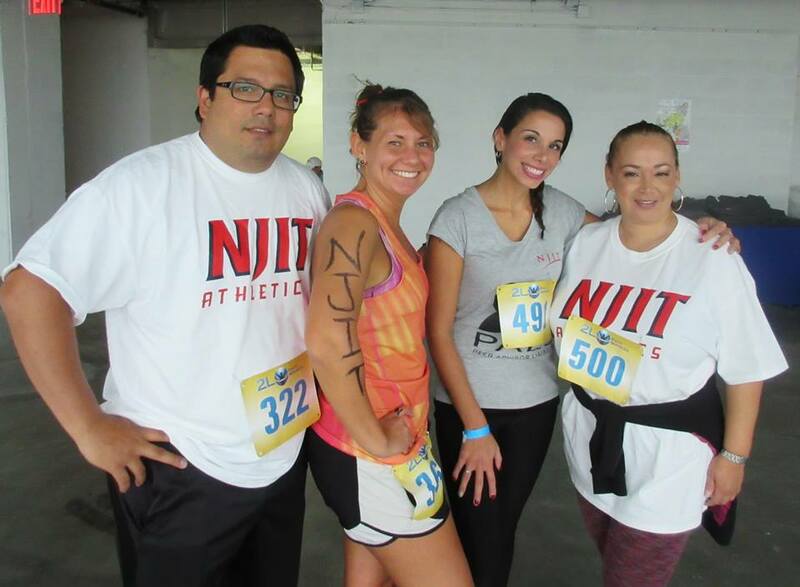 NJIT raised $1,655, dominating the climb due to a large attendance of over 20 climbers and volunteers from both students and staff. The Honors team had four student climbers – Anmol Mittal, a senior Biology major and upcoming medical student at the Rutgers New Jersey Medical School in Newark; Ryan Merluza, a senior in Mechanical Engineering Technology who previously served on nuclear submarines in the U.S. Navy; Tyler Baggett, sophomore Mechanical Engineering student and lacrosse athlete, and the project’s initiator, Nicholas Concepcion. 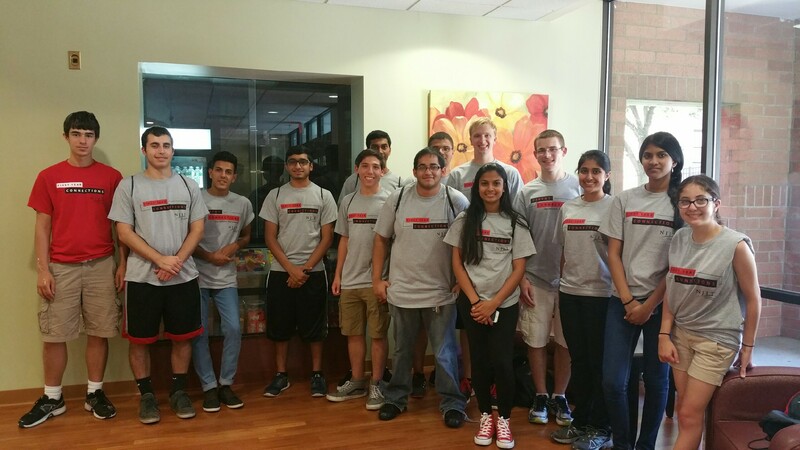 Honors team volunteers included sophomore Lyna Lam (Biology), freshman Shrina Patel (Biology), senior Nicholas LiCausi (Architecture), sophomore Lourdz Vallejo (Mechanical Engineering), and sophomore Biomedical Engineering students Anthony Chirayath and Rohit Premkumar. NJIT raised $1,655.00 for After-School All-Stars (ASAS) Newark, a national after-school organization that aims to ensure that 1,200 children in Newark and New York receive quality after-school programming. 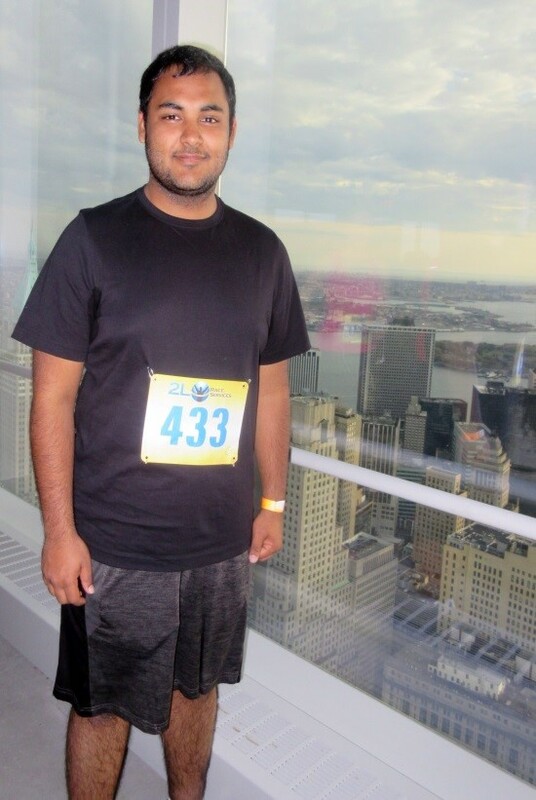 We did this by climbing a skyscraper: the NJIT Stairmasters team climbed all 1,632 stairs of 4 World Trade Center to support the After-School All-Stars. It’s only fitting that the driver behind this fundraiser, Freshman Nicholas Concepcion (Chemical Engineering and NJIT Fencing Team) won a medal for placing first in his age group by climbing the stairs in 11:29. Nicholas placed 4th out of 129 climbers overall! Nicholas wanted to do Climb 4 Kids after hearing about it from ASAS Executive Director, Dax-Devlon Ross. When Nicholas first asked me if climbing a skyscraper would count towards his service, hours, I thought, “That’s a strenuous way of getting service hours.” But then I thought, “Why not give other people at NJIT the opportunity to climb a skyscraper for a good cause?” As a result, Nick’s idea turned into a larger initiative in which the entire NJIT community would be involved to give back to Newark. As Nicholas was talking to me, I was reminded of a time when I was in his shoes. During my undergraduate years, I was a student-athlete and proposed the idea of starting a ponytail drive for breast cancer awareness to a staff member at the Center for Student Involvement at Montclair State University (MSU). It all started with me wanting to donate my hair, but I wanted to give other students the chance to do this as well, not just for the makeover, but to give a part of themselves to women who have lost their hair due to chemotherapy. The staff member made it happen. That was a defining experience for me in terms of how I want to support students. The way my idea was supported inspired me to emulate that with my own students and be approachable, realistic, and open to new opportunities. To this day, MSU still holds a ponytail drive. Similarly, thanks to Nicholas, I’m sure that Climb 4 Kids will be a sustainable service opportunity that will result in other initiatives that we have planned with this organization. Festo Didactic, the world-leading equipment and solution provider for industrial education, presented a colloquium at the Albert Dorman Honors College on Industry 4.0, Smart Factories, and Growing the Next Generation Automation-Capable Workforce. Mike Nager, Business Development Manager for Festo Didactic in Eatontown, NJ, spoke about disruptive technologies throughout history, presenting the students with the question, “What will be the next disruptive technology in manufacturing?” Looking at the “D” words typically associated with manufacturing (Dirty, Dull, and so on), Mr. Nager pointed out that the Smart Factories of today are quite different, with clean, brightly lit environments and specialized robots performing most of the mundane tasks. Festo Didactic’s mission is to train capable individuals to maintain these elaborate systems and be able to integrate advances such as RFIDs and machine-to-machine communications into manufacturing environments. Mr. Nager ended his presentation with a series of thought-provoking slides about industry disruptors, citing that the largest cab company in the world owns no cars (Uber) and the largest room rental company owns no vacation properties (Airbnb). After the presentation, students asked a variety of questions, including whether or not manufacturing would return to the US. Mr Nager stated that manufacturing is indeed returning to US and will bring with it new jobs, but not the jobs of the 1970s assembly line, and that is the gap that Festo Didactic is committed to filling with its learning factories, training and e-learning programs that directly evolve from technologies and innovations in automation. Torsten Schimanski, also in attendance that day representing the Festo Didactic Learning Center in Eatontown, NJ, published a LinkedIn blog post about the upcoming colloquium, the continuing growth in robotics, and opportunities for those willing to learn the skills required to be a part of Industry 4.0. You can read Mr. Schimanski’s blog post here. 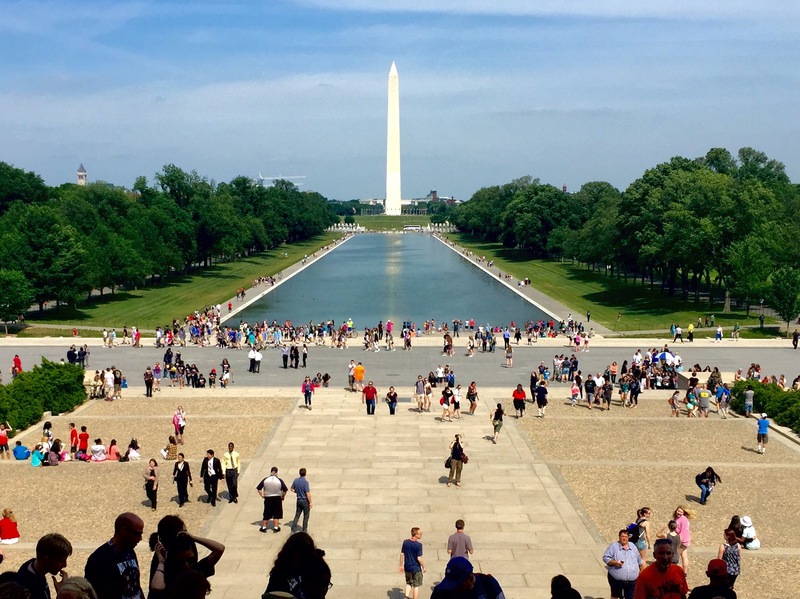 This post concludes Honors student Ryan Merluza’s retrospective of the 2015 Washington D.C. Study Tour. “The following day, we took a trip to Capital Hill to visit the House of Representatives side first, then to the Senate. They kept us active and engaged for the most part of the day, but I enjoyed every minute of it. You felt the history walking through the marble-floored hallways and basement tunnels that connected the different buildings of Congress. We met with two of New Jersey’s Congressmen, Albio Sires and Donald M. Payne, Jr. They spoke in great detail about their responsibilities and the difficulty of how their decisions made in D.C. can bear the weight of affecting their communities back home. In between meetings while walking through the basement tunnels, we met Georgia’s Congressman John Lewis. He is the last of the “Big Six” that led the Civil Rights Movement that is still alive today. He told us how he met Dr. King when he was only fifteen and how what they started back then is still not finished as he continues the fight towards a greater good. This post continues with Honor student Ryan Merluza’s retrospective of the 2015 Washington D.C. Study Tour. The first stop during the tour was the Office of Naval Research described previously. Next, the students went to the National Mall, followed by dinner with NJIT alumni. “Following the Office of Naval Research, we ventured to the National Mall to visit the Lincoln Memorial. It was my second time there, but this time around I noticed an engraving on one of the steps that I didn’t see when I was a kid. From where I stood, Dr. Martin Luther King Jr. gave his famous ‘I Have a Dream’ speech. Standing there, I tried to envision the millions of people surrounding the Reflection Pool and I took a moment to reflect on the progress we have made as a society. Here I was, surrounded by a diverse group of scholars that come from all different walks of life. Even with the negativity and imperfections that are still prevalent in today’s society, I am able to stay optimistic that Dr. King’s dream will still fully come to fruition. Perfectly fitting, the memory of Dr. King gets brought up again in a later experience during this study tour.